The Rosmark army begins emabarkation for the Siege of Adelheim. Under the watchful eyes of the Engineers, the marines of the Starborde Battery load packing material as soldiers of the Irish and King's companies mount the gangway. Two days until I depart for Historicon. Loaded up with anti-biotics, pain killers in reserve. According to Google Maps, I have a 4,000 km round trip planned. (Roughly the same as last time and the time before though the stops along the way are different.) thats an average of three 8 hour days of driving each way if anyone is wondering. Due to the various stops, it never works out to even days though, so usually a 5 hoiur day, a 9 hour day and a 10 hour day. I need to keep a close eye on myself this year given health concerns and am prepared to add a day or so on the way home if I need to take a break and may skip some attractions that are off the path if I need to shorten the drive a little. In keeping with the siege theme of the games that Rob & I have planned and the fortress that Duncan, Norman and Rob have built, my en route touristing will have a fortress theme but will also link to my planned alternate history Aroostock War campaigns. After visiting family near Fredericton NB, I will cross the border on July 4th, the 1st anniversary of my heart attack, I understand the Americans have been gracious enough to declare it a holiday. The first stop will be the remains of Fort George at Castine, Maine which the British occupied during the Revolution and again during the War of 1812, temporarily moving the border south to the Penobscot River. Something they just may try again in 1843. However, should they wait that long they will face a new obstacle. Fort Knox, Maine. Built in the 1840's to protect Bangor from British/Canadian invasion. My 2nd stop will be to visit the nearby Fort Knox. (Who knew there were was more than one Fort Knox? Not me until 2 days ago.) This diversion in Maine means there will be no time to visit Gettysburg again, but it will give me a feel for another area of War of 1812 operations as well as some potential battlefields south of the border for my alternate history campaigns. I have had a tendency in the past to zoom down the Interstate missing Maine altogether apart from 100's of kilometers of trees and distant mountains. On the way back I hope to stop at Ticonderoga if I have the energy after the convention, or at least take a look at Fort George. I have been to both locations before, but never while they were open to the public! Also on the list is Fort Lennox on Ile Aux Noix in Quebec. This fort was a main base of operations for the British during the War of 1812 and would have been prominent if relations with the US worsened in the 1830's and 40's. I went to school just down river at the College Militaire Royal de St. Jean but never made the trip to see it, something I find hard to explain. Too much time playing ancients and drinking beer I suppose. There is a hitch here as the Richelieu River experienced its worst flooding in decades and clean up is still in progress at Ft Lennox so it may be off the menu. I'll keep an eye on the website and make plans accordingly. Fort Lennox above water from the Parks Canada website. One last stop if all goes well, will be to slip into the US again and see the blockhouse called Fort Kent. The seat of war on the Arroostock. Then home again to rescue my wife after 11 days of double shifts looking after her mom and her menagerie and running her new in-house grooming shop. The route below is approximate only. I appreciate having google lay out the broad strokes for me but I rarely go exactly where and how they tell me. There were lots of things I should have been doing today, Renovations, Gardening, Housework, Preparing for my departure next Saturday on a 10 day jaunt to Historicon. Staging my 4th refight of Chrysler's Farm in as many months was not on the list but after 3 days with a gradually worsening tooth ache whose throbbing speaks of infection, and forced me to reinforce the pain medication with a little of the Water of Life, I was not in a mood to tackle anything serious. Luckily all the hard work had been done so it was an easy thing to set up the table. Besides, there is nothing like an historical refight to test a set of rules. The armies at 2pm. The battle was fought in November so for once the bare trees are appropriate. At my chosen scale of 100 yards per hex, I rechecked the map and ended up with more of the river on table. This in turn allowed me to field the gunboat on table but it doesn't seem to have made it into any of the pictures. The width of my individually based figures meant that I should have fielded 8 of them per 300 men but I fielded 12 anyway or 1 per 25. Only 1 unit was on the narrower bases that had the right frontage but it made very little difference to the game. For the artillery, I fielded 1 gunner for each real gun giving the British a gun with 1 crew up forward and another with 2 crew farther back. The first US gun with 2 crew arrived on turn 4 while the 2nd gun with 4 crew showed up 2 turns later. For the singly based units, I just laid the casualties down and removed figures that failed to rally. For the multi-based units, I used red caps for not yet tested casualties and white ones for permanent losses until there were enough to remove a stand. Marking the casualties and leaving them on table more accurately reflects what is going on and the stands were much easier to move but the markers are a pain and the individual figures more fun so that one is still up in the air. Once again I based the American attacks on the historical battle. I started the battle at a slightly later time than the first time so gave myself only 2 1/2 hours or ten turns at which point the Americans should be defeated historically. To reflect on the poor performance of the American commander, he was not allowed to move or to join any units. Luckily for him, his remote commanders, making the main attack, only failed their command rolls twice. Unluckily for him they were at a critical moment. As the first clashes occurred over the gully and in the woods, I knew the Brits were in for a rough day. I rolled the same dice for both sides but whether it was for movement, shooting, melee or rallying, the Americans seemed to be getting the Lions's share of 5's & 6's, leaving most of the 1's and 2's for the British. In retrospect, rather than boosting the British regiments to Elite, I should probably have left them as Regular down graded the Americans who lacked experience and training and had had a rough fall with sickness and a long wet journey. 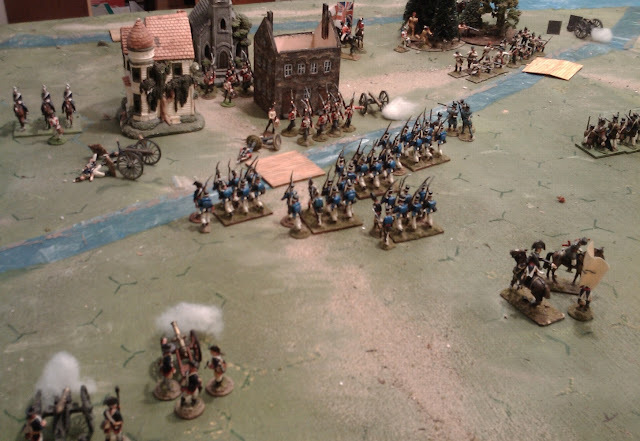 This time the American columns were able to keep up with the historic advance, or they would of if I could have coaxed the Voltigeurs to retreat as ordered. These things usually turn around though and eventually luck evened out, aided by the gunboat, and both attacks were thrown back and several broken British units rallied. By the start of turn 9, all the British units apart from the guns and the 49th Foot had been broken and just barely rallied. One good push would break the army but 6 out of their 7 original units were still on the field. 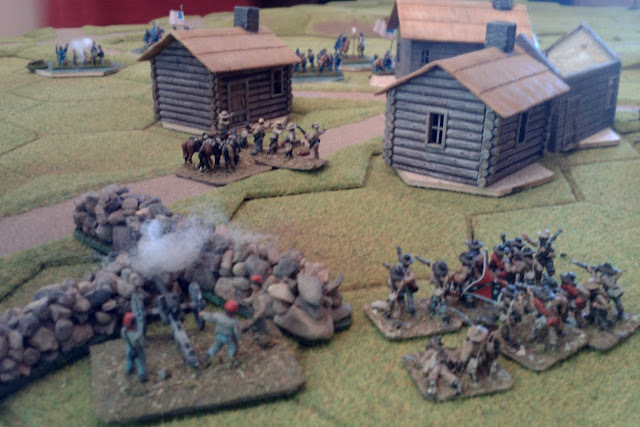 The Americans had been even harder hit after the last few turns. Three units were still in good shape but only 6 of their original 10 units were still on table, and 2 of those were broken. It was do or die. The cavalry were ordered in. A damn close run thing. As the clock struck 4 pm, the American army started to retreat. After their defeat at Plattsburg Valley in May, the Anglo-Mexican army fell back along its supply lines into Mexico. By the end of June, the army had been rested and reinforced and was ready to take the offensive again. General Hubert deployed a scouting screen comprised of Larsen's Lancers and los husares amarillos de la tierra de rosas or the Yellow Hussars as they are usually called in British accounts. On his left he deployed 2 guns then the 1st Brigade with the 1st Canadian Battalion supported by the 27th Foot. The Governor General's Bodyguard were deployed to their left. To their right were two more guns with the 2nd Brigade deployed in line beyond them, the 2nd Canadians, Royal Marines and then the San Carlos active militia. 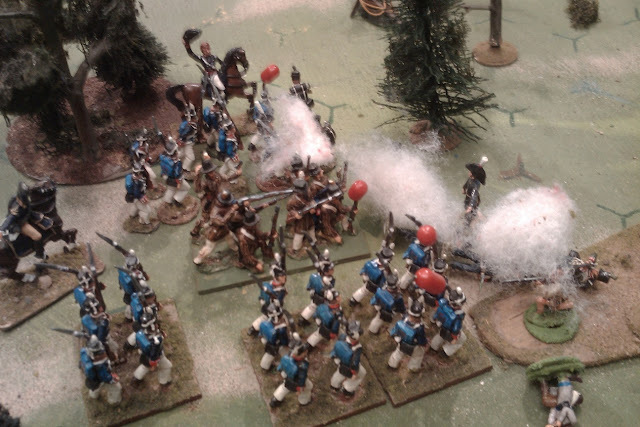 The brigade was screened by the skirmishers of the Victoria Rifles. General Hubert quickly grabbed the initiative and kept it nearly the entire day. (The Americans winning the toss on only 1 turn which was what they wanted since it allowed them to fire first consistently). His plan was to bombard the defenders of the West Bridge while attacking the East Bridge with infantry. At about 10 am he ordered the guns to open fire. The 2nd brigade pushed forward aggressively and the rifles were soon engaged but were were driven back by cannister and the fire of the Bangor rifles which had come forward to support the defence. The line quickly stepped forward as the Rifles rallied and a protracted firefight began, The cavalry screened was recalled and formed in reserve despite some reluctance of the farther Hussar patrols to retire. Casualties were mounting fast on the Allied infantry by 11 o'clock as they were raked by American artillery and hammered by the aimed fire of their infantry when a courier arrived from the Yellow Hussars reporting that they had located a ford to the East of the island. General Hubert contemplated this discovery and tried to decide what to do (5,6 switch the main attack to the ford, 3,4 send the cavalry over the ford but keep pressing the bridges, 1.2 ignore the ford until at least 1 attack on the bridge has been repulsed then check again). His troops were already committed and pulling them back might be difficult. The Americans seemed to be unaware of the ford and he decided to keep it that way unless he had to use it. 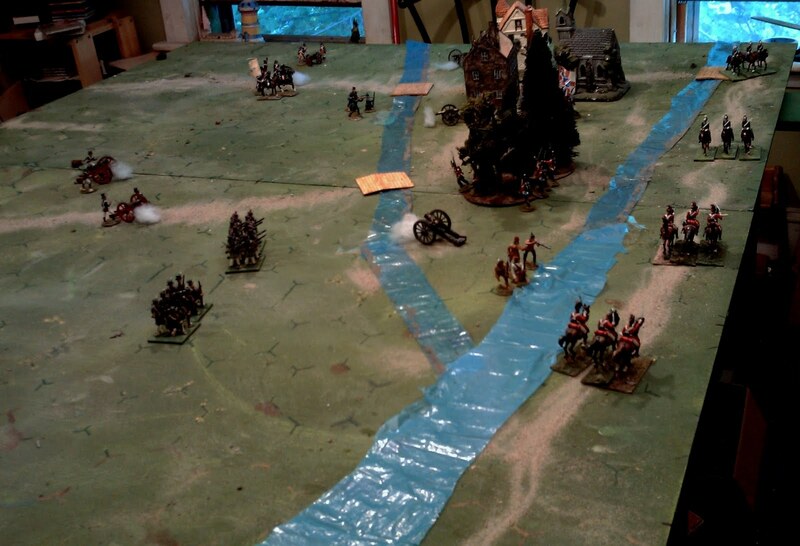 As the Lancers fell back, the Canadians were ordered to seize the now undefended bridge. 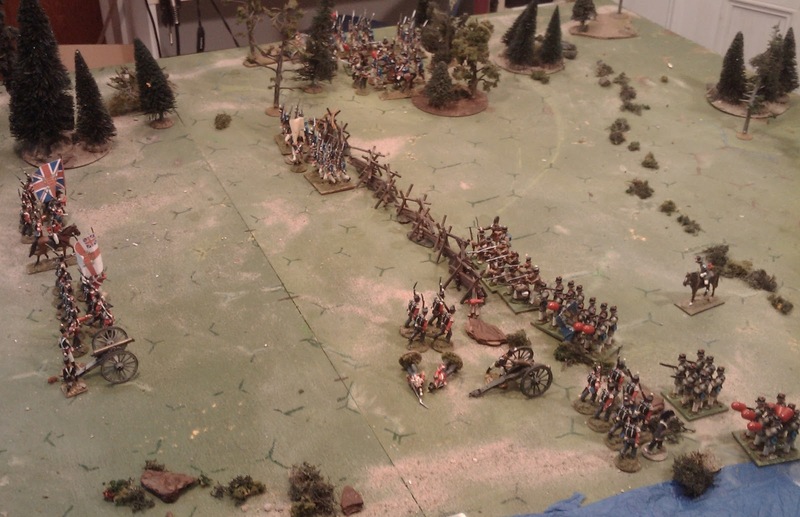 They formed column and rushed forward but were barely across the bridge when they were hit by the US Dragoons and sent fleeing back through the 27th who calmly opened files to allow them through. The Dragoons felt the urge to pursue across the bridge, a move that might have won the battle, or lost it right there, abut they heeded the bugle playing Recall. As noon approached, the situation was looking desperate and General Hubert reconsidered his options. He decided to send the cavalry over the ford and began issuing orders. With the enemy infantry momentarily pushed back, the British artillery concentrated on counter battery fire and eventually silenced first the gun in the center and then the one west of town. The left hand battery was ordered to limber and move forward. There was a slight delay but by 1 o'clock they were deployed within point blank range and had opened fire on the American troops manning the roofs of the adobe houses. To the east, there had been some hesitation (failed out of command tests) but eventually the cavalry crossed the ford and deployed under an ineffective rifle fire from the Bangor Rifles who had been pulled back through the wood to oppose them. By the East Bridge, the weight of numbers finally began to tell as first the mountain battery was silenced by rifle and musket fire, then the 3rd Infantry began to waver and was pulled back to regroup in the cover of the woods. 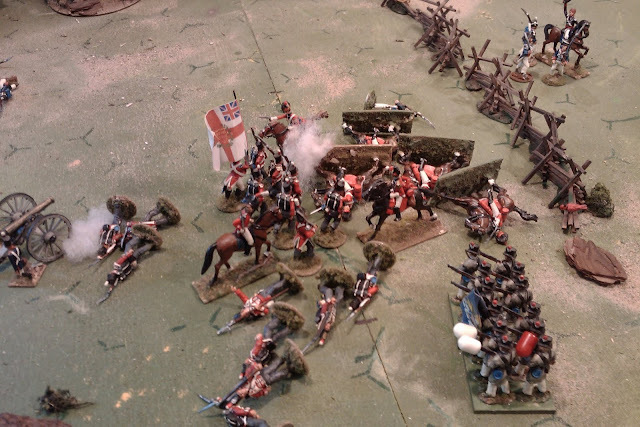 At last all was in place, the Yellow Hussars charged forward and clashed with the Mounted Rifles, driving them back. It was now or never, the General issued orders for an all out assault. The San Carlos Militia formed column and stormed across the bridge while the 1st Canadians and the 27th Foot fixed bayonets and stormed across the bridge and into the town. In a matter of minutes it was over. The American infantry, weakened by a long bombardment and an extended firefight, fired a ragged volley then broke and ran all along the line. 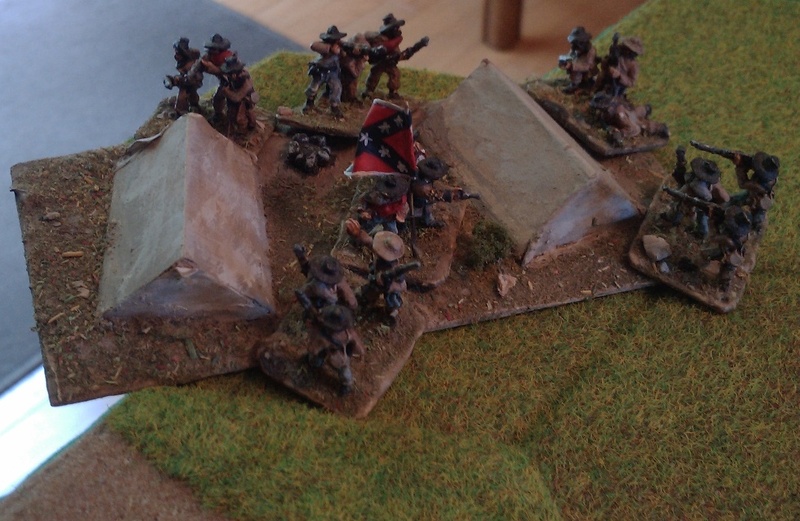 The Mexicans pursued through the woods, catching the Bangor Rifles from the rear and pinning them against the river. The GG Bodyguard passed through the Hussars, formed and charged forward into the Dragoons who spurred forward to meet them. After a brief clash, the Dragoons gave way and the Bodyguards drove driving the Dragoons and the remnants of the Mounted Rifles from the field. In town, the 27th following hard on the heels of the 1st Infantry drove them back through the narrow streets, over running the remnants of an American battery. General Ross, having taken refuge with the 2nd Infantry was trapped. Reluctantly he authorized a white flag of surrender. What can I say? This was the most exciting Solo game I've ever played. All I wanted to do afterwards was to reset the game and play again. The game last 10 or 12 turns (I got too involved to keep track) representing about 3 hours of real time and took about just over 3 hours to play. It felt like what I have been struggling to achieve for 5 years. I believe I have the rules for both my 1812 and Indian campaigns. Don't worry, I grabbed a towel before running down the hall from the bath, hollering in excitement. Its not even a new idea, just one that I came up with a few years ago but couldn't figure out how to implement. The break through is due to those Damned Hexes of all things! I'm not really using them at the moment except to provide guide lines on arcs of fire and to estimate distances but that latter was the key. Let me go back a bit. I have long liked variable moves as a way of building in all the little things in life that interfere with things being done as quickly and efficiently as the General planned. But I also like long moves, in particular, long moves with big penalties for doing something other than straighht ahead. Various attempts to increase distances by increasing dice, doubling moves etc failed, in part because I hate rolling handfuls of dice and adding them up and hate multiplication even more but yesterday it occurred to me that the hexes provided a built in x4 multiplier. My first thought was, "Oh, that will be too long a move and too big a variation". My second thought was to sit down and calculate the best average distance per hex given the battles I want to fight and cross reference it with my preferred time scales. If marching to the front without any interference, a rare thing if the maximum is rolled, then infantry will be able to move 1,200 yards. Given a time scale of 15 or 20 minutes per turn, this is close to the full theoretical distance they could cover and the average of 6 to 8 hexes is close to the average that could be expected. With penalties for being engaged and for moving to the flank or rear, it can be to pull back engaged troops in good order and fancy maneuvers are risky. It obviously wasn't going to work with the card based movement sequence as that calls for very short time slices in a low level setting that allow quick reactions. OK for skirmishes where the commander is shouting orders directly to sub units but not for battles where orders are going down through a chain of command. I fell back to one of the oldest systems, taken straight from Featherstone's Battles with Model Soldiers and which I have used successfully in the past. If it were a rhyme it would be ABBAM. A moves, B moves, B fires, A fires, resolve melee. The basic combat and morale rules come straight from the latest MacDuff rules as I am quite happy with them and they have stood the test of time. 1. A hex = ~ 50 yds (or 1"=10 to 15 yds, 1 figure=10-15 men which was the original MacDuff scale. This is only really good for a minimum of actions where I have details. If I had a 7'x9' table it would be ideal for almost everything I want to do but that would require evicting my wife and doing a major renovation to the house with the stairs coming up under the table. On the other hand there are a few actions which fit though there is always the option to fudge up to the next level. 2. A hex = 100 yds (or 1"=25 yds) 1 hex full of troops = ~300 men This will allow me to fit 75% or more of the desired battles onto my 5'x6' table. You will note the switch in troop definition. If I play this scale enough, I may be tempted to base for it allowing me to put 12 figures per unit (or 1/2 unit if at full strength) or about 1:25 but in the meantime, my singly based or 45mm wide multi-bases both allow me to fit 8 figures to a hex giving me between 30 and 40 men per figure depending on how I want to fudge it. 3. A hex = 200 yds (or 1"=50 yds) 1 hex full of troops = ~ 600 men. This is only required for the bigger Sikh War and Mexican American War battles. It would require only 24 man (or 36 if I rebased) British brigades if I stuck to 40mm and would really strain 40mm terrain. I can see reserving this scale for smaller figures, perhaps should I ever decided to go 10mm. (Don't hold your breath.) The alternative is to fudge the battles down to fit the lower scale by adjusting orders of battle, compressing some terrain items and by chopping the edges of the battle, shortening approach marches for example. The interesting thing is that the mechanics could still work for all scales, just the time scale and ranges would have to be adjusted. However, since I have 2 different engines to work with, my plan is to drive MacDuff back down to the lowest levels and keep the old card draw for a sense of immediacy. Turns would be probably 5 or so minutes long. Hearts of Tin (with or without a new name) would re-emerge for the small to medium battles. The idea will be write the rules to allow the use of a grid without making them necessary. I haven't written up the rules yet with all the dots and crosses, definitions, variety of troop types, fringe elements and so forth but here is what I've been testing upstairs. One game is never decisive but this is the most engaging solo game that I have ever played (but I think a live opponent would be even better). 1st side Orders phase. The active player must announce what each unit is being ordered to do. 1st side movement phase: The active player rolls for each unit and moves it in accordance with the orders given then goes on to the next one. His opponent may challenge what appear to be attempts to back pedal when ambitious plans start to fall apart. 2nd Side Shoots all eligible units and resulting casualties are removed. 1st Side shoots all eligible units and resulting casualties are removed. Post Shooting Morale. Check for broken units and retreat them. Check for leader casualties. Post Melee Morale. Check for broken units and retreat them. Check for leader casualties. Pursuit. Move any pursuers then resolve melee and morale again. Repeat as needed. Replace Leaders. Replace leaders who were hit in a previous turn. Infantry and artillery roll 2 dice, Cavalry rolls 3 dice. Out of command: If a unit is not within 12" of its brigadier or if the Brigadier has been wounded or has joined a unit then roll 1 die before moving. 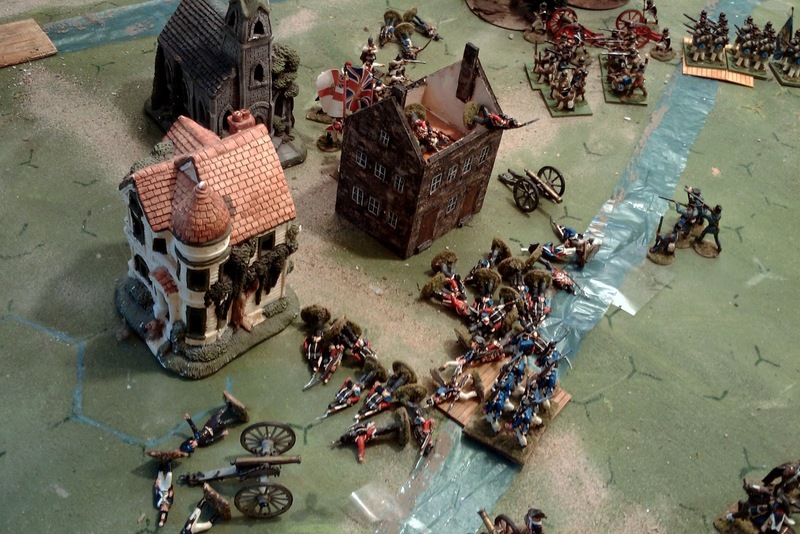 If a brigadier is not within 24" of the General or if the general has been wounded or has joined a unit then he must roll as above and the result is applied to all of his units. -Cross a passable terrain obstacle such as a ford or wall. Movement through woods etc is halved for infantry and is impassible to artillery and cavalry. Troops moving in column by road add 1die as long as they stay on the road. Roll 1 die per 4 infantry or 2 gunners. Front 2 ranks of infantry. Units that are in a continuing melee may not shoot. A score of 4,5 = 1 hit 6= 2 hits. Roll 1 die per 4 infantry or gunners or 2 cavalry. Formed Infantry may count 4 ranks, cavalry only 2, skirmishers only 1..
-2 Fighting to flank or rear. If during any morale phase, a unit has lost over 1/2 of its original strength, it must immediately retreat 1d6 hexes, back to the enemy without any penalties. If a unit is not adjacent to the enemy and is ordered to rally instead of moving then roll 1 die for each casualty. Broken units must rally if possible. A score of 5 or 6 will bring the figure back into the ranks. Any other score removes the figure permanently. Risk to leaders. If a general or brigadier is within 12" of at least 1 unit which suffered leader casualties or was attached to a unit which fought in melee, regardless of casualties. Roll 1 die, on a 6 he is wounded. He will be replaced at the end of the next turn. So what is the relationship between time, ground scale, how far your troops can move and what sort of order or activation system you use? Put very simply, it takes time for a general to decide what orders need to be given, to issue them, for them to be transmitted to a subordinate, have him decide what needs to be done to implement the order and then issue his own orders and so on down the line. How much time? Well, it depends on a lot of things including what level of game you are playing. Since the games I intend on playing will usually have 6 to 8 regiments, the orders usually won't have more than 500 or at most 1,000 yards to go and will be issued to either a Brigade commander or directly to the regiments, possibly in person. So perhaps as little as 5 minutes might be taken up with orders and perhaps another 5 minutes to prepare to execute them and get under way, less if the units being ordered were already prepared and just waiting for the word. Once under way, the troops will progress at at least 50 yards a minute, usually faster but there are often little delays so lets say 50 yards. Typically they have started within 1,000 yards of the enemy and often from as close as 500 yards. So between 10 and 20 minutes are taken up with the approach march. Resolution of the attacker will rarely take longer than another 10 or 20 minutes. Taken together, the time taken to issue and prepare to execute the orders will be as long as the time taken to close with the enemy and as long as the combat takes to happen. There was a time when written game orders and short turns with multi-turn combat resolution (at least for firefights) were in vogue (eg WRG 3rd ed Ancients, Grant's The Wargame). Usually these orders were changed by a courier with a minimal loss of time though I have played several rulesets where there was a chance of misinterpretation and delay (eg Bluebear Jeff's Tricorne rules that I had the chance to enjoy a game of a few years ago, see also the last issue of CWJ). The older rulesets called for orders to be written in realistic terms and left it up to the player to interpret them in good faith. Some rules also tried to impose a need for players to justify issuing a change in orders. Reaction by subordinate commanders to local conditions was always a matter of contention leading various rulesets to adopt reaction tests or start specifying official orders such "Attack", "Hold" each of which placed obligations and limits on what units could do (Shako is an example of this approach). One way to avoid the question of orders is to lengthen the turns so that the order, preparation, approach and combat all happen within 1 turn, with the possibility of the combat not being fully resolved. (Volley and Bayonet is an example of this approach). There is a lot to be said for this, especially when playing large battles but for smaller battles it can result in a very short game with few player decisions being made and battle resolution potentially resting on a handful of combat resolution dice. So what about something in between? Lets say the process was that this turn I issue the order and the unit can change formation and perhaps shuffle a bit to line up, next turn the unit moves up to 500 yards and into contact with the actual fighting happening the turn after, assuming the enemy was still there? If playing an opposed game, that would introduce some interesting challenges, in much the same way that Charge! does with its long moves and written turn orders. You might see a courier arrive and the enemy prepare to move, but where is it going? Played solo however, there would be no mystery so one would have to rely on role play or some form of AI, reaction charts etc to determine the other side's reaction. On the other hand, you could assume that the order phase was taking part behind the scene and just make the moves long enough that there is not quite enough time to fully react on the other side, and possibly not enough time to safely change one's mind, and make the combat results drastic enough that 1 turn of combat will sometimes be enough to resolve an attack. It seems to me that this is how many of the older sets operated whether using simultaneous or alternate moves. (eg Morschauser, Featherstone's rules in BWMS, Charge! ) This approach also reduces the need to fiddle with units to edge them closer to where they might be needed and allows an attack to wait until an artillery bombardment can be made rather than needing to start moving right away in order to make it into contact before the game ends. One other approach to add texture without shortening turns that I have experimented with in the past, is to lengthen the moves but have a multi-phase combat resolution. This was inspired by Simon MacDowall's Comitatus where units halted at bow range, there was an exchange of missile fire then units whose morale held closed to javelin range (if desired), then exchanged shots again and finally, charged into contact if morale held. This shows some of the detail and flavour of the combat without allowing players to change orders every 5 minutes. Fire and Fury sums up this approach well by having long moves then resolving combat by having defensive fire then offensive fire then melee. Pouring another coffee and contemplating the game laid out on the table upstairs. Friction or There's the Rub. One has been a discussion on the OSW Yahoo group, another comes from several recent games and another from the usual sorts of mind probing that goes on when I'm tinkering with rules and reading as I have been. Lets take one example from a game that works quite well, the Portable Wargame. The scenario was a meeting engagement and I found myself having to choose between fighting and bringing up reinforcements. From a gaming POV it was an interesting decision to make. From a "simulation" (sic) POV, it was not unrealistic that my reinforcements weren't arriving as quickly as I would have liked or that I had to pause and regroup my forces periodically. However, the thoughts popped into my head at one point, "why does that regiment keep stopping its march when it has orders and can see and hear that we are engaged" and "why does that other regiment stop shooting?". Now there might be many reasons why but the rules are designed for the over all effect, not to explain why, They do, however, present these interruptions as the result of the player's choice rather than a random event outside the player's control. (Keeping in mind that it was theoretically possibly to roll enough pips to activate everything at once, even without my late General.). Would I have been happier with an activation system that froze the unit without input from me? No, based on past experience, I am much happier being given some control over how the friction affects me. It was actually the stop/start nature of the approach march & combat that caught my eye, and yes, I have experienced this sort of thing in peacetime training marches which is one reason I like variable length moves. (harder to implement when a move is a small number of large hexes). The point is that though the exact rate of march varied, we didn't need an order every hour to keep going. Short of "enemy" action, the collapse of a bridge, getting lost or similar, once going, we would keep marching till we reached our destination. Likewise troops might need an order to commit themselves to combat, but once engaged, the fighting will go on until one side gives wa or a new order is received. So what if we took our activation die, but fewer of them and used them to indicate how many orders a commander could issue in a turn. Each order would include a "posture" if you will, attack, march, defend etc and a destination or locale. Once the order was issued, possibly with a roll for delay or failure, it would apply until either achieved, stopped by enemy action or superseded by a new order. So that attack on the left flank, if you suddenly wanted to stop it, you would need sufficient activation points to cancel it, otherwise you would have to watch it go in, unable to intervene. Yes, I did try inserting something similar into Hearts of Tin a year or two again. I'm now rooting about for details of how I tried to integrate it and why I dropped it. I have a feeling there was over complexity over levels of command and a conflict with other aspects of the game, not to mention questions of determining the reaction to enemy interference.. The related questions about time, space and the speed at which a game progresses will have to wait. Its back to building a safe bunny exercise yard. After a hard week, today was a welcome game day. After a nearly 15 year hiatus, we broke out the 15mm ACW figures to give the Portable Wargame another spin. Ron set up the Scenarios for Wargames version of Sawmill Village and we each selected 12 units plus a General. I chose 2 cavalry, 2 artillery and 8 infantry, Ron went for 4 cavalry, 2 guns and 6 infantry. We decided to play straight up with no optional rules but did agree that the cavalry would dismount if pinned rather then charging like European cavalry. The gallant boys in grey advance. To be met by the brave boys in Blue. At 2 hexes per turn up the road, it was a long, dusty trudge up the road. The cavalry, riding ahead on both sides clashed with a loss of 1 stand a side before the troopers dismounted and started occupying houses. My artillery unlimbered early and assisted by my august commander, began shelling the empty street in front of a Yankee held house. 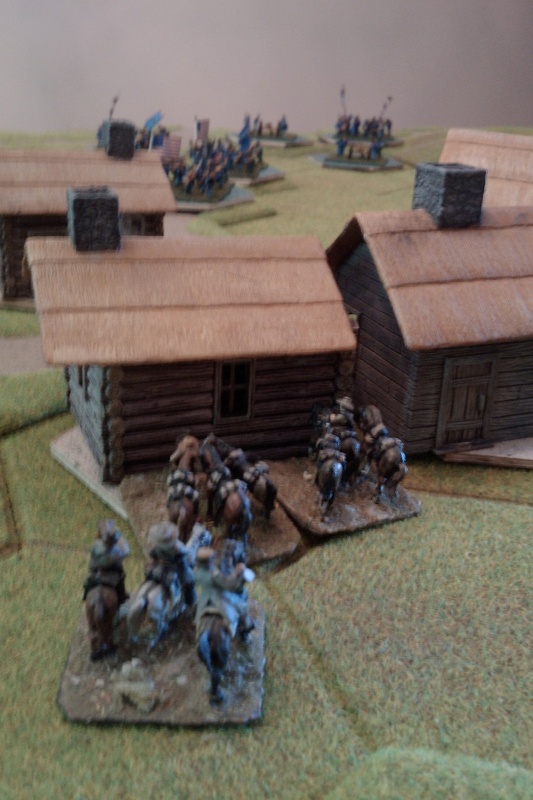 Leaving the gun as the column of infantry arrived and blocked its field of fire, General Ross rode up to direct the fire of my cavalry who were ensconced in one house, exchanging fire with their counterpart across the street. 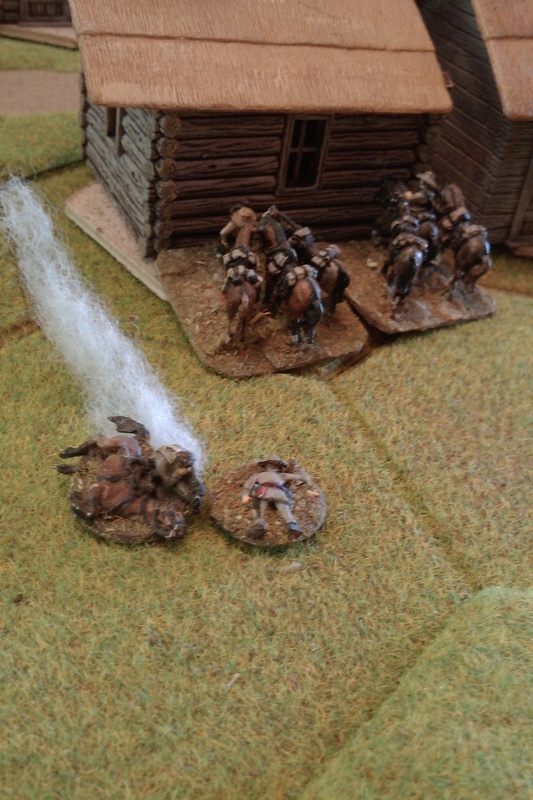 It worked and the opposing dismounted cavalry were eliminated. 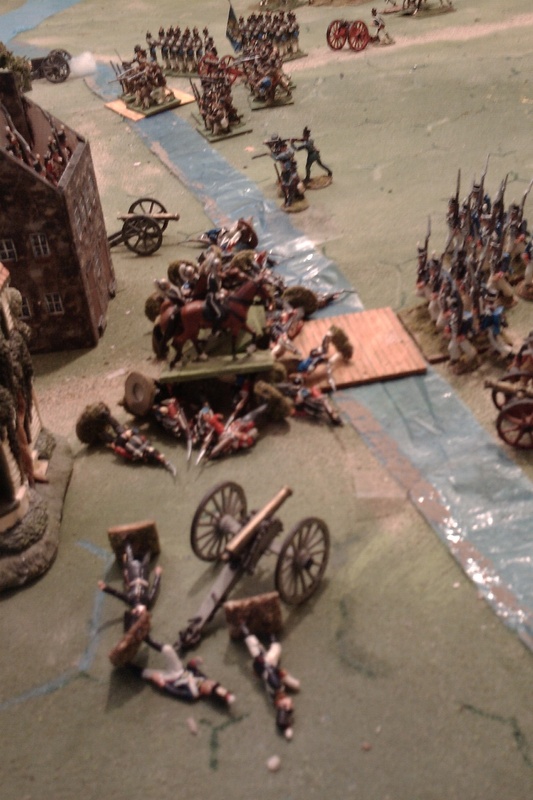 Then the Yankee artillery opened fire, overshooting the house slightly. Ron needed a 1 or 2 followed by a 6 to pull this off but there was an air of inevitability as the dice rolled across the table. The loss of the general's activation die made it hard to move up my reinforcements. On Turn 12, the boys from Arkansas, tired of waiting for their turn to march on, set up camp on the edge of the board. On turn 15 they lit camp fires but on turn 17, they finally got an order to move up. For a while, with Sheridan effectively directing the fire of his men, and being down first 1 die for the loss of my general, and then another as my casualties mounted faster than Ron's, the game looked lost. 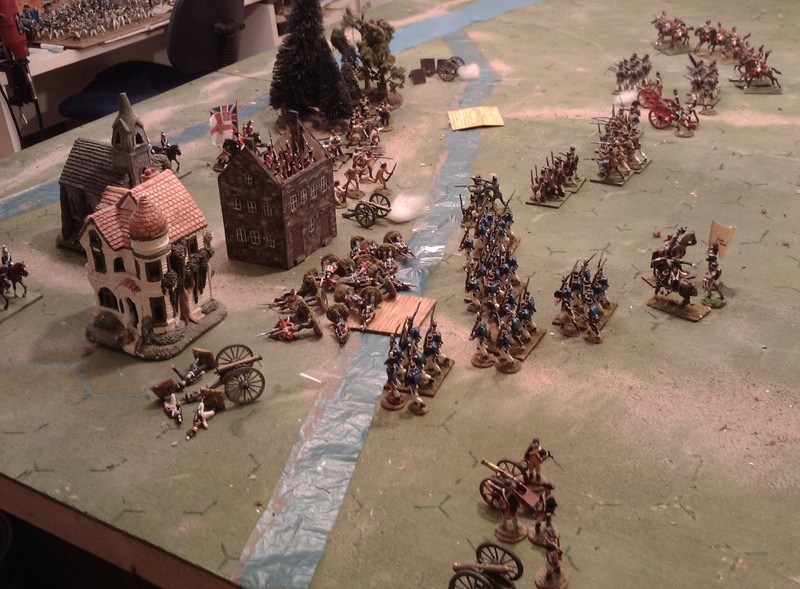 Eventually though, as I let my pinned troops lay low to focus on reinforcements, clinging to 1 corner of the town and letting my artillery carry the weight, I was able to form for an attack and inflicted enough casualties to start evening out the battle. It didn't last though, Ron's fire cut down several of my units as they formed to attack and a prolonged firefight from cover resulted. One poor cabin on the edge of town proved a death trap for Ron's troops, I think in the end 3 or maybe 4 of his units were marched into that ruin only to die. Too little, too late. As my cavalry prepared to mount and charge Ron's guns, they were pinned and yet another infantry regiment was shot down dropping me to below 1/2 my strength so I conceded the game. The game was enjoyable, but it felt a bit sluggish and didn't bring to mind the dashing accounts of the civil war. Between the movement rates, the activation dice, the long ranges and the 5/6 chance that a unit would be destroyed or pinned before it got close enough to attack, neither of us was able to assemble and launch a serious assault so the game was a prolonged firefight between troops in cover with the occasional 6 being what drove it forward. For the Civil War that's not all that wrong but it didn't feel right somehow that long range rifle fire was the best answer to an entrenched enemy. After a break to pillage the Yankee food supplies, since Ron had just got a copy of John Curry and Bob Cordery's extended version of Morchauser's book we reset the game and played it using Joe's original Musket Era rules. Because we were playing on a small table with hexes, we adjusted the movement and shooting distances by dividing by 6 and rounding down (for example infantry with a 12" move and 18" range became a 2 hex move with a 3 hex range). I didn't take pictures of the early turns because they looked identical to the first game. I didn't take pictures of the later turns because they were too fast and exciting and I forgot! The longer moves, the ability to move and fire and the reduction in rifle fire effect made the game much more open. The huge increase in artillery effectiveness made this arm critical although one had to be careful about being overly aggressive with it since its melee factor was so low. It was also interesting having to worry about flanks again. Since the rules are so bloody, we decided not to call it at 1/2 casualties but played to the bitter end. This led to a battery and an infantry regiment in town facing 2 cavalry units lurking behind a hill. Their was a period of maneuver and indecision as Ron tried to figure out how to get close enough to over run my gun without being graped. He finally figured out a plan which involved risking a shot from my infantry which duly missed. As I retreated my infantry, imagine our surprise when I lifted a roof and discovered that in the heat of action, 1 regiment had entered the building and been forgotten! With 3 units, I felt strong enough to try flushing him out from the hills. As I cautiously advanced, he made one more dash but this time I didn't miss. The game may have lacked some detail, for example no rules for cover and no role for Generals but the game was fast paced and exciting. Every move and decision had to be carefully weighed as to risk and gain and the stakes are high. The activation dice provide an interesting source of additional friction, especially in a solo game, but being totally in charge of your own fate is also interesting and blunders still happened from time to time........ One thing we did miss was the rolling for initiative with the chance of a double move. This is something I have used on and off for years and am quite fond of the added edge of possibility and uncertainty. Some rules for cover wouldn't go amiss and the tank like ability of artillery to move and shoot needs to be tamed, but after all these years it is still an exciting game which rewards a table top general who can master the principles of war. A good and enjoyable day and more food for thought. I see again a niche for Hearts of Tin and my 20mm ACW troops but it needs to be stripped down once again. The Rosish Army on maneuvers in preparation for the coming summer campaign season. After a quick run through of the scenario using Charge! 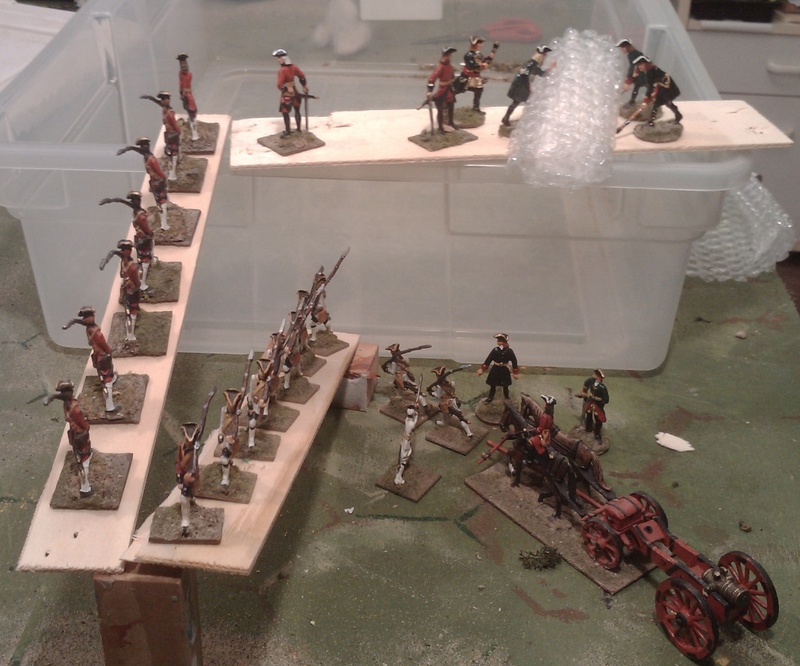 mostly to get ready for Historicon but also to double check that its not right for my 1812/Aroostock Campaign. (Its not, at least not played solo on a 5 ft wide table. 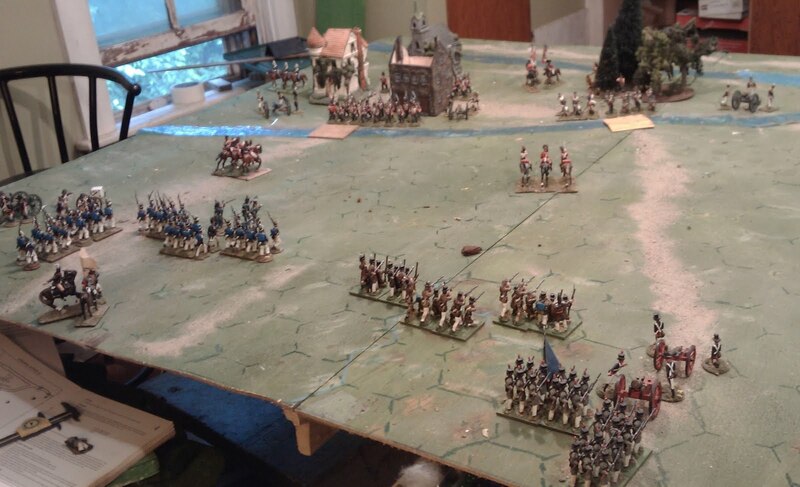 ), I reset the table for a MacDuff game using the Oregon campaign figures since they are part of the same project and based and organized in the planned fashion. Then I opened up the rules again, primarily to adjust all distances to multiples of 4" so I can use my hex grid to eyeball distances and avoid the heavy weight of a tape measure or the frustration of seeking yet another misplaced ruler when tired. While there, I did a little of the inevitable nudging, especially where I found things to be getting arcane rather than natural, all minor apart possibly from putting melees back into the "resolve when they happen" mode. When I was done I felt pretty happy but once again, they appear to be a fairly thorough synthesis of MacDuff to The Frontier and Hearts of Tin. So what do I call them now???? The latest version is available on google docs . Here is the game set up and ready to run with the changes noted in the last post. 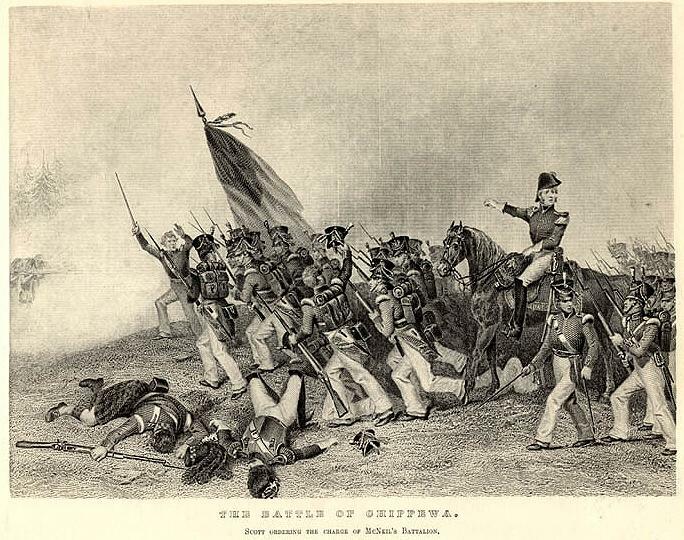 The British are deployed as per the book with 2 companies of the 41st Foot lining the river near the town bridge and 2 more in reserve in the middle of the town, a company of embodied militia and another of sedentary militia by the wood bridge, a band of Mohawks in the woods, a troop of cavalry behind the woods and another to the west of the town. One gun was placed on each end of the line and a 3rd gun in the middle. Since I wasn't using the optional quality rule, the sedentary militia were as good as the British regulars. There was no real reason not to use the rule other than for consistency with the previous test. The fewer things one changes between tests, the better. 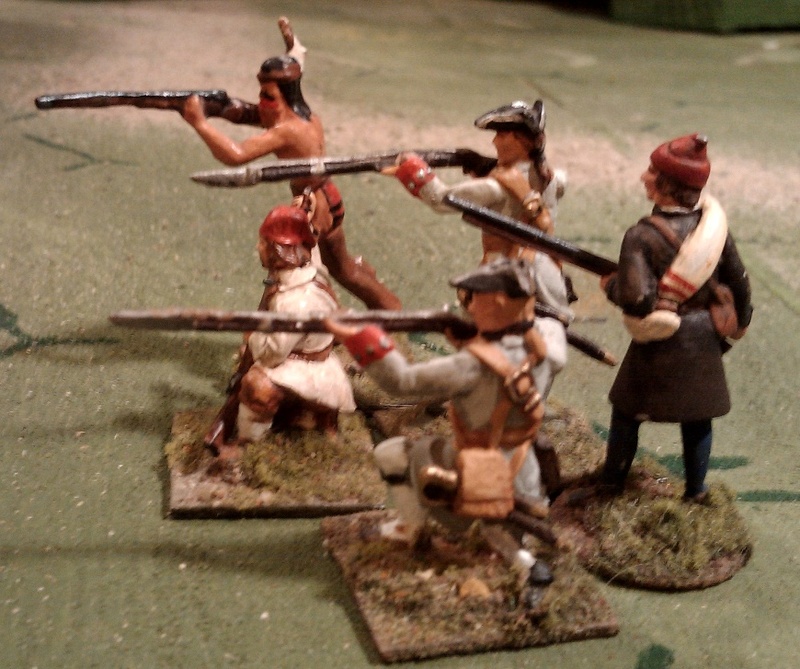 The Americans deployed according to my plan of attack which was based on there not being a secret ford. Ordinarily I would lean towards a weaker pinning attack and a main assault but given my superior numbers and the limited approaches fairly close to each other, I decided that I could gamble on two equal thrusts and shift forces as required if one bridge proved to be too tough to crack. Therefore, I deployed 2 guns on the left to support the attack on the left bridge and committed 5 companies of the 4th and 6th Infantry .supported by riflemen to the assault on the town. The 3rd Ohio was earmarked to assault the Wood Bridge but had a fair distance to go. They were supported by the 1st Ohio which moved up in the center to provide fire support and the 2nd battery of 2 guns. The cavalry was spread out in a scouting screen as per the scenario. Initially I tried to limit battalion moves to companies of the same regiment. This was easy enough with the Ohio regiments as they each had a unique uniform, it proved problematic with the regulars who were like peas in a pod so I decided that it wasn't worth the hassle. 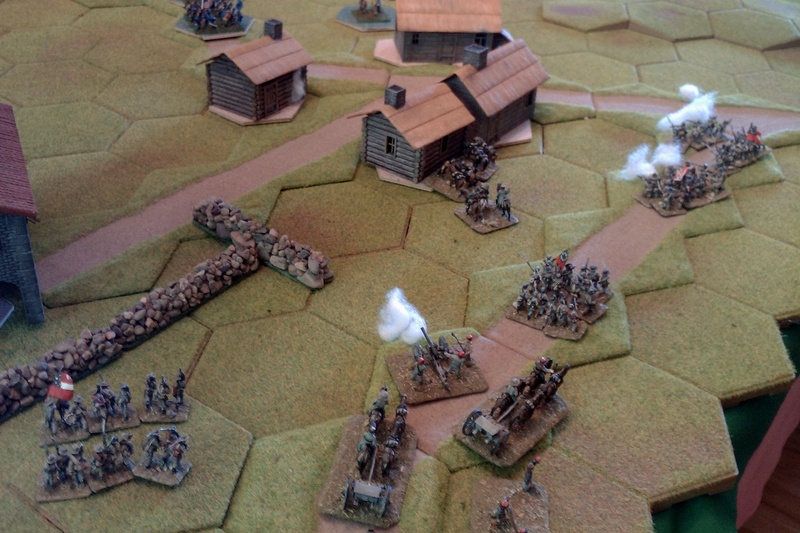 The game began with the first American shot silencing the British right flank battery. The American line is skewed away from the river so the right hand US guns had to be rushed up the road to get in range and found themselves hard pressed to get a clear shot. Eventually the cavalry was moved and the infantry shunted off and they duly silenced the left hand British battery. In the center, the Riflemen moved forward through a storm, ok light shower, well more like a scotch mist of cannister and silenced the center battery with their long range fire. So by turn 6 or so, all 3 British guns were silenced and not 1 US casualty caused, despite the dense columns that had been presented as targets. ARGGHHH. The gunners are blaming it on wet powder. Without artillery though, the defence of the Southern bridges was hopeless so the British commander started pulling back to gain respite from the US guns and to force the Americans to come forward through the defiles created by town, woods and river so that he could meet them 1:1. It took the Americans awhile to get organized as their battalions had gotten spread out and disorganized but eventually columns of infantry and guns pushed forward. It was hoped that the Stone House would serve as a strong point to bottle up that flank but the riflemen drove the defenders out with a few well placed shots. 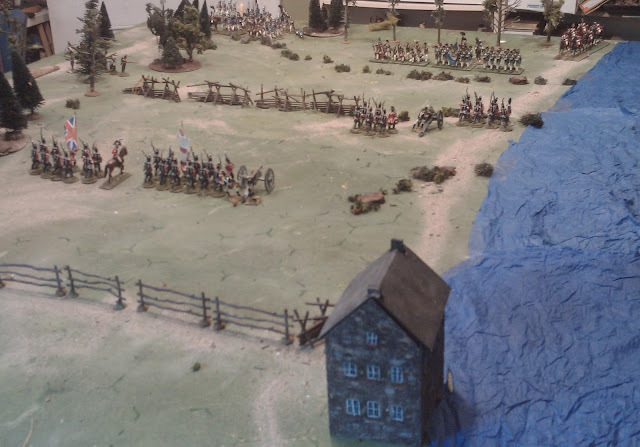 A firefight between the 1st Ohio and the Lower Canadian militia was short lived with the battered militia breaking to the rear. With nothing left but a handful of Indians and Canadiens, it was time to go. The only thing I wasn't too happy with, was the ease with which the defenders of the Stone House were destroyed by long range fire. I wouldn't want to make all cover invulnerable but it would certainly be possible to designate particular structures as invulnerable to shooting in some scenarios. On the other hand, if I had used the optional Troop Quality rule, a company of Grenadiers able to absorb 3 hits would have been much harder to shoot out of the house. It also would have made the British artillery more resilient and made some of the firefights more prolonged, all of which would have improved the period flavour. The remaining question is, would this modified version, including the Quality rule be suitable for my 1812 campaign. In particular, how small and how large a game would be workable? and how many figures would I need for my campaign? In TableTop teaser type scenario terms, this game was middling in size. This game saw 20 game units in play. According to the rules, a table of my size should be able to handle 27, which by an odd coincidence is the about the maximum average scenario size (I think one may be slightly bigger). I will probably double the light infantry as well since that arm played a major role. I will leave the cavalry for now since it was a rare commodity and the country rarely suitable for its best employment. A game with only 6 or 7 units would be fast but with the 2 strength points provided by the Troop Quality rule, would have enough meat to be interesting I think, especially if in a campaign context. Most of the units in this game were composed of 8 infantry. Three of these make up one of my existing regiments and make a convenient battalion but 2 would match the scenario/unit set up. With a planned campaign force 12 regiments, this would be 24 units or 192 infantry for each side. (assuming no substitutions are allowed in campaign games apart from local militia possibly). These could be mounted on a mix of individual bases and 4 man stands as I felt like. American infantry in road column. (No don't grab the rules, its just about optics). 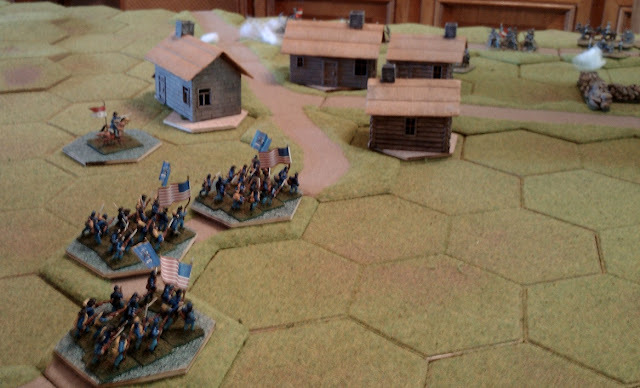 In front the 3rd Ohio with 12 man units on 2x1.75" sq bases. In behind the 1st Ohio on slightly smaller bases, 8 men per company on 2 4 man bases. The Select militia in line, 8 individually based figures. These match up well with the 2 4 man bases but pitted against 12 man units with the same combat performance you start getting trash talk going on in between games. I did have 1 regiment (3rd Ohio in grey hunting shirts) tacked onto tight bases with 12 men per unit (15mm per file). This would give 24 men per unit or 288 infantry per side and require all troops to be mounted on group bases since this is the only way to get toy soldiers into close order and still stand up. The 8 man units look fine to me so I'll stay with that. I might be able to squeeze 4 horse men in per unit but 3 is going to be easier. That's only 12 horsemen per side using the 4 cavalry units that appear in the 1st book but up to 18 in the Programmed book. I may go with the 4 units but field 2 game units per scenario unit which will allow me up to 24 cavalry per side which should be sufficient. So in terms of range of scenario, feel and numbers of troops to be painted, it seems to tick all the boxes. So, the modifed Portable Wargame makes the Short List of Rules for my upcoming campaign. Next up was supposed to be a MacDuff game but I have some ideas bubbling in my head and need to get some Charge! practice in so the Rosmark forces will deploy for an exercise and rules test while I am waiting. 1,2 Your attack is all set. Do not reveal the ford to the enemy and disrupt your plan by sending troops over the ford unless the main attack is repulsed. 3,4 Send a small force of cavalry over the ford to distract the enemy. 5,6 Forget the attack, make the attack over the ford the main event. Use artillery and some infantry to pin the enemy at the bridges and weaken him and send everything else over the ford. The trick as so often, was how to translate the scenario forces into game forces. The only rules of thumb are the maps that show infantry units as being about 1 foot wide on a 5x7 table and a comment that infantry units are twcie the size of cavalry and light infantry units. (In other words these were originally designed with The Wargame in mind). I decided to start with the Portable Wargame and 1 stand per unit since that worked for Ron& I for 18thC games. I also decided to play straight up with no optional rules. The end of the 1st game approaches after about 1/2 hour of play. The game went quickly and was OK but just didn't feel like 1812 and somehow the forces didn't feel right for the scenario and I had no feel for whether it was a battle between battalions or a skirmish between companies. I also had problems again with how the Pin rules work for close order early 19thC infantry. For a few moments I thought about moving on to the MacDuff test but there was a nagging feeling that it wasn't that far off. 2. Pinning. All rules pertaining to pinned units are ignored due to the discipline of close order units and the poor accuracy and volume of fire of muzzle-loading smoothbore weapons. A report on the second battle will follow. Morning mist on the river obscures the British position as the second game gets under way. These are the requirements that I need to get sorted before I can finally sink my teeth into this early 19thC Historical Fantasy. TROOPS. The look of these is easy enough now that I've got myself talked into believing that I don't need to be overly fastidious about historical accuracy for a a fictional, ok fantasy campaign that may end up being fought over a non-existent stretch of the US-Canada border where it follows the Neverwausie River. Essentially the uniforms will be a blend of 1814 and 1837-9 uniforms with a leaning towards militia uniforms often illustrated but rarely worn in battle. My US Regulars in light blue were easy to paint up and accurate for 1839 but really I wanted something like the 1820's vintage blue coated regulars in Davy Crocket. Oddly enough the bell shako and white pants look was popular with Militia and Volunter units for years later so would have been perfectly acceptable if I had thought to look beyond the regular army. This engraving is in a book I've had since I was a kid and exactly the sort of thing I had in mind when I started but was too "serious"? "shy"? to pursue initially. I'm going to fix that. I'm also going to take it as licence to add Highlanders and maybe even a Horse Guard in busby and cuirass someday. I lifted this copy of the image from the website for the 1st Battalion of the 22nd Infantry. The following one is from the NY Public Library Digital collection, a marvelous resource. Doesn't quite match the latest research but its exactly what I had in mind so new units will follow suit. I often only use 5 or 6 units in a scenario and very rarely more than 8 so I figure if I paint up 12 regular and volunteer/militia units in various 1812, 1820's and my existing 1839 uniforms, I can pick and choose to suit. The same plan applies to the British & Canadian forces. I will worry more about consistent style than conforming to the latest historical research. 1) The Hearts of Tin approach: Five 40mmx40mm bases with 4 figures each for use with Hearts of Tin. This was a front runner for several years but there are some issues with the odd number of bases and the organization and basing doesn't work especially well with either MacDuff or the Portable Wargame which are the 2 main rulesets being considered. It can however be tweaked by going to 4 or 6 bases or by ditching the bases altogether. 3) The 90mm Approach. Two 45mm square bases with 6 figures on each make a unit. Up to 6 of these would make a brigade or in other words, each unit is 1/2 a battalion, a detachment or a very weak battalion. Alternately each stand is a company and I tweak the rules to allow 2 units in 1 hex. This would add some much needed flexibility when running a campaign and wanting to do some small actions. This option gives a realistic shoulder to shoulder deployment of troops and will allow the most figures in the smallest space. I'm not sure if that's still good or if its now bad. After much pondering, I finally remembered why I pulled back from this close deployment before. With a wider frontage, it doesn't matter if some troops are on bases and others are individually mounted. With the tight formation, the frontages won't match so either 1 unit has an advantage or else you have to equate an 8 man unit on 1 side with a 12 man unit on the other. It works but it looks/feels wrong and I am always suspicious of adopting something that looks/feels wrong as a base. At the moment Option 2 is ahead, especially for its flexibility in a campaign situation . TERRAIN. Replacing unsatisfactory or worn out terrain has been a priority for a while, but very little action has been taken as I haven't been able to decide where I am going to fight, some or all of Denmark, India, South Africa, Eastern North America and the North West have all been considered over the last decade. No sense in making Adobe houses for New Brunswick or Wooden clapboard houses for India. Having decided on an Eastern North American setting as the main theatre of operations, I can now proceed to lay out villages and farms, woods, bridges etc and see what I have that works and what needs to be replaced or added. sighhhh I just know that this is going to mean working on trees. Damn. TABLETOP SITUATIONS. OK I stretched this for the sake of alliteration, basically, what sort of games will I be playing. What mix of Tabletop Teasers and similar scenarios and historical refights, skirmishes, little battles, big battles? It all affects the design of scenery and selection of rules which in turn affects organization. Looking back over various games and settings that I've enjoyed over the last few years, I've gotten the most fun out of the mixed Faraway & Oberhilse campaign. Really what I want to do is just bring that home so I don't HAVE to make up everything. The more I read on the smaller engagements of the War of 1812, the more it seems like an ideal campaign for me, especially if the historical constraints are lifted somewhat. Getting the right units in the right places, getting just the right numbers and a balanced game, the after affects of changing history in one place when playing out a campaign or of ignoring the effect of reversed outcomes when playing a campaign and so forth. 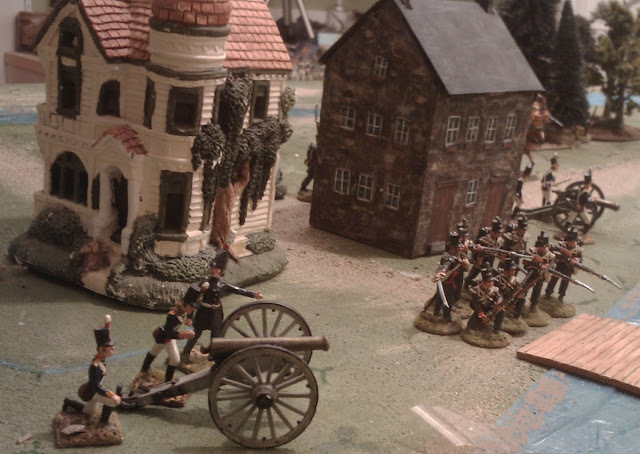 So in essence, a fantasy campaign set in a mix of real and fictional locations, people and units during a fictional war between real countries, played out in a series of Table Top Teasers, some of which will be homemade ones based on War of 1812 actions. This means the rules and organization used will have to allow for ambushes of convoys and yet make a clash between 1/2 a dozen battalions feel like the struggle for a continent. Its only 2 weeks until I leave for Historicon with some preparations left to do not to mention non-wargaming obligations so I don't anticipate a lot of progress till this fall, but I think I need a play-off between MacDuff and the Portable Wargame, a series of scenarios played out once with each rule set to decide which will be the primary set for this campaign. I may also need a new title for this campaign. I am leaning towards "The Defended Border". (The US-Canada border having been widely publicized in the last century as the "longest undefended border". A phrase which seems to have gone out of favour these days of border security and passports. **Post script. I have just added a page providing information on the "real" Aroostock War. Just some background right now but I plan to include a list of units, uniforms, personalities and so forth. The link is up top. As war draws closer, the King has authorized a new field battery. 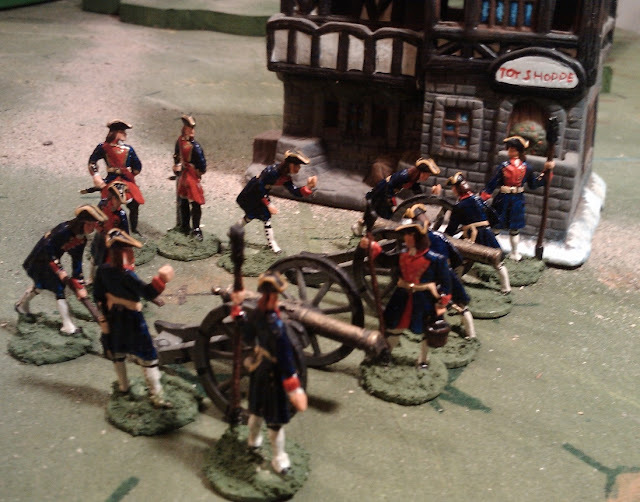 Here is the St George battery, drilling with borrowed guns. The Royal Foundry has promised delivery of new gun barrels soon. The unit is dressed in the traditional Blue and Red of the army's Field Artillery as opposed to the Red and Green of the Marine batteries. I'm not old though lately I feel it some days. It is now 40 years since I took up wargaming and even a most optimistic assessment is that there are not 40 more years of wargaming ahead even if I do live to be 96. Given family history and my own medical history, state of my eyes and mind etc, I figure anything over 20 years will be a gift and if I'm painting more than the occasional token figure 10 years from now, I'll be surprised. A cause for gloom and despair? Not at all, its about planning for best effect. Lets start with figures, three things are colliding here: expected painting rates, room to display or store figures and ability to use them. I have never kept careful records, its not in my nature and frankly, I usually don't care. Still, looking back, there are few if any years when I painted less than a 100 figures and I know there have been years when I painted 400 or more. If I set a goal of no more than 200 figures a year, that's still 2,000 more figures to incorporate or get rid of. I don't have room to store let alone display what I have at present so the policy at a minimum is going to have to be: 1 in 1 out and preferably something more like 1 in 2 out, at least in the short term. Since I like to use as many as possible of the figures that I have painted, as often as possible, it also behooves me to revisit my planned and existing collections to see if it all still makes sense or if I need to make some changes in direction, perhaps drop some less played or less favored collections or merging some to allow a more in depth. treatment with more trimmings, terrain and troop deployments and less bait and switch. I also need to ensure that I am planning for my my 5x6 table interms of number of figures and style of terrain and scenario. Barring major, unforeseen changes in my life, I think an average of 25 games a year is not an unreasonable expectation, counting two short games in a single session or a long one spread out over separate days as a single game. Indeed, for the next few years I hope to better that by anywhere up to double. So at a minimum that's at least 500 games ahead. Don't worry, I'm not about to start planning the last 500 games out in detail, but it certainly sounds like there is still scope for variety and more than 1 campaign. But it also sounds like I'd best get cracking on the things I really want to do since I have some things that are still waiting after 40 years of diversions! Hmm, what an odd thing is taste. Mixing Scruby/Zinnbrigade figures with Sash & Saber bothers me enough to ALMOST spoil a game but it seems that mixing semi-flat with fully round Prince August, Irregular, Trident and maybe even Sash & Saber, doesn't bother me at all. Hmmm I sense a forth coming merge of Rosmark and the Acadian War of Independence into the NQSYWinA. Hmmmm The Yellow Hussars patrolling for Indian raiding parties? I actually played through the game three times, but I kept adjusting and tinkering with rules as I went so have discounted the 1st 2 games (1 victory for each side btw). There wasn't anything really wrong with the first tests but various things were awkward and the first game, seemed to lack depth in terms of player involvement. Since the primary goal was to test and develop the rules, this post is focused on that aspect of the game rather than on a narrative. For the same reason, although I did my best to translate and deploy the Hyborian Age armies as closely as I could within the framework of a Gathering of Hosts Mede-Lydian battle, ( see previous posts) I made no effort to recreate the battle, going so far as to deliberately avoid rereading Don's account apart from the set up. That said, the set up pretty much dictated the battle plan for each side. The game broke down into 3 struggles, the fight for the bridge, the fight for the Pimple on the Mede left, and the fight in the center. Since the fight for the bridge was isolated, I'll deal with it first. The Medes had 4 stands of horse archers and 3 scythed chariots to drive off 4 stands of unarmoured spearmen and 4 of archers led by a Captain. Due to a lapse on my part, I several times forgot that the horse archers didn't have their own captain. I think in future that I will include one for each of what would once have been a "unit". In the end it made little difference as the archers rarely moved but traded long range shots with the Lydian archers while trying to soften up the Thracians. Periodically, one of the Scythed chariots would thunder across the bridge when the Thracians looked a little shaky), but none of them could roll up when they needed them and at the end of the game the Medes had lost 3 chariots and a horse archer stand while the Lydians lost 1 spear and 1 archer stand. Equal forces had been committed, the Medes in a gamble on getting a force into the Lydian rear, the Lydians to holding them off. In the end the casualties slightly favoured them and they did hold the bridge but if either unit had been committed in the center they could probably have tipped the balance while the other could probably have held the bridge on their own, or at least held it long enough. The Medes moved rapidly to seize the Pimple with archers and spearmen and these held off assaults by cavalry and elephants for most of the game. On the end of the line, there was little the spearmen could do under attack by light cavalry but hunker down and rally off hits until the light cavalry finally remembered that they could prevent the rallying by moving close. This put them at risk of combat with the spearmen when the Medes had the 2nd move but they got lucky and on the one occasion that the spearmen managed to catch a few cavalrymen (shades of Platea), the spearmen rolled a fistful of 1's and 2's and only inflicted 1 hit allowing the cavalry a chance to pull back before the next round of melee. The veteran Skythian archers on the hill served as well as has been their wont over the last 35 years. Every time the heavy cavalry approached close enough to charge uphill, the archers would roll a fistfull of 5's and 6's forcing the cavalry to choose between rallying back, (a 3 or 4 turn process depending on the activation or order rolls, the stands have to retreat individually to a safe distance, then spend a turn halted to remove a hit then turn individually and form up into a battleline again ) or facing a high risk of being wiped out as they rode down the archers. One of the elephants did mange to charge uphill and destroy a stand but was taken down itself (must have been those Skythian hand axes but then, it was a rather small plastic elephant). While the fight for the Pimple was going on, neither side dared advance too far in the center but the Medes thought they saw an opportunity and launched their cavalry against the allied Hoplites, catching them as they maneuvered. It didn't help and they quickly rallied back and reverted to tossing javelins. In the center, the 2 stands of archers managed a hit on the Garrison elephant which immediately panicked, heading straight for the Lydian spearmen but being killed by the mahout just before it reached them (in other words their move ended up just short as can be seen in the background 2 pictures above). Much later the archers managed a hit on the last elephant, Ellie the vintage Airfix elephant, who also panicked and ran towards the Phyrgians (what is it that attracts elephants to Phrygians?) Having started adjacent to them, she caused a fair amount of mayhem on her way home. Not a sterling day for the elephants. During the 1st playtest, they had all gotten into contact, either without being hit or not panicking, and wrecked havoc on the Mede spearmen and archers. Dangerous beasts but not to be relied on. At last, the lines were sorted out, the elephants chased off, hits rallied and with the Lydian general ordered an attack all along the line. The Greeks again proved their worth in melee but, alas, the Phrygians, with the general at their head were no match for the Medes and were wiped out in short order. Things looked bleak for the Lydians, without a General they were down to 2 order dice vs the Medes 3 and had lost 8 stands in all and were 6 away from demoralization while the Medes had only lost 4 at this point. I nearly called the game but the Fat Lady hadn't sung yet and the Captain of the cavalry was in no mood to rein in as his riders topped the hill. With only 2 stands of archers in position facing the cavalry, the Skyths ran out of 5's and 6's. The Medes had been reduced to a single stand of cavalry and 2 engines on the near bank and 3 stands of horse archers on the far bank. The Lydians still had 4 stands of cavalry, 4 of spearmen and 3 of archers plus an engine, not to mention 2 captains. A Pyrrhic victory for the Lydians but that is better than no victory at all. Of all the versions of the Gathering of Hosts that I've tested over the last year, this was the most satisfying yet. The Order dice may not be original but they work. On occasion, a bad roll will limit a player's actions unduly but in most cases there are sufficient to do what needs to be done as long as an army is well ordered. Once an army is engaged in combat, or if it is allowed to fall into disorder, then there are almost never enough points. The key thing though is that player decisions and the interaction of the armies trump the die rolls in determining friction, most of the time. The shooting worked as intended from the very first version, but better than ever before. Long range fire can weaken an enemy and in particular can weaken or even turn back an attacking force but on its own, cannot usually do much damage as the enemy can generally rally off hits as quickly as they can be inflicted, as long as he doesn't move... In order to destroy the enemy, troops need to be sent in close to stop the enemy from rallying which puts them at risk of reprisal. If you can time it just right, and are favoured by fortune, a barrage of missiles followed by a charge can burst an otherwise secure line. Mobility helps though, especially so you can pull back quickly if it doesn't work. A Parthian army suddenly sounds very dangerous, as long as the terrain is open and the enemy doesn't have too many missile troops and cavalry. One concern is that the melee dice may be too generous. I want the ability to destroy an enemy stand in melee but I'm not sure it isn't happening too fast, or maybe it was just lucky dice. On the other hand, it does keep the game exciting and I don't know that historical clashes weren't often short apart from when too heavily armoured infantry blocks collided, something I would also expect to go on a while under these rules. Only more playing will tell but that may have to wait on my part until after Historicon. The version I used are posted but I know there are some little things that aren't explained as clearly as they should be and I keep finding obsolete bits that didn't get edited, and some little suggestions and examples that may not be quite right. For example I don;t think that I've made clear that Captains can only lead troops assigned to their command at the start of the game, not just any old stand that wanders into contact with their battleline. Lots of work to be done yet.